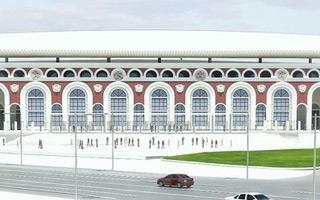 In Minsk we can clearly see the outline of planned new Stadion Dinama. And we don’t only mean the monumental arcades of the old ground, much of which were retained and portions demolished for future replacement. We mean the crescent-shaped north, east and south stands. With two tiers and 23 rows each, they’ll hold most of the audience. Final capacity of new national stadium is expected to reach 22,000 seats, over 15,000 of which will be covered. Most uncovered seats will be located in the south and north where the roof will leave significant openings. Late last week the stadium was visited by deputy prime minister Anatoly Kalinin. The politician confirmed that works will last 12 more months, allowing delivery before the end of 2017. The west side, which will comprise most of the stadiums facilities (to meet both UEFA and IAAF regulations). Above the regular tiers of seating this side of the stadium will have to levels of boxes topping the structure. Altogether there will be 8 floors (!) in the west, 4 of them below ground level. This is also where majority of the planned 2,000 m2 of office space for lease will be located.